The Healing School is facilitated and managed by Charis Bible College, Heidelberg, WC, SA graduates, who have a heart and passion for the Truth, with the aim of restoring health and wholeness to the body of Christ. Services typically cover: Foundational and healing teachings and teaching through God’s Word followed by personal prayer and ministry. Healing School Brochure: Download the Brochure here. 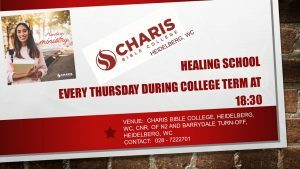 All invited to the Healing School services presented every Thursday at the Charis Bible College campus at 18:30.